HARRISONBURG, Va. — During a rally in downtown Harrisonburg yesterday, Republican gubernatorial candidate Corey Stewart unveiled his new, state-sponsored plan for health care, calling for the reintroduction of and reliance on medicinal leeches and kitchen cutlery. Stewart, who recently proclaimed his admiration for the Confederacy at a rally in Roanoke, said the new plan, which has been dubbed “Antebellum Healthcare,” will be an answer to “the disastrous, tax-hungry plan of Obamacare,” and will save citizens money by utilizing medicinal ideas that were regularly used before the Civil War. Health insurance has long been a debated subject at a state and national level, with many arguing that current policies place too much financial burden on society as a whole. 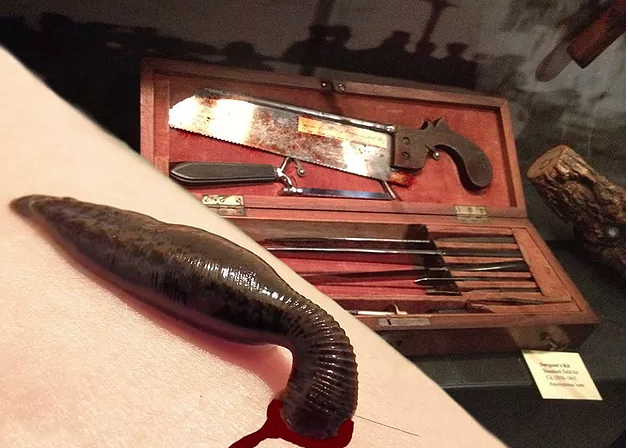 Stewart’s new Medicaid plan would be a single-payer system in which users pay the state to fund leech breeding and foraging for excess kitchen cutlery. Sally Demaire, a supporter of Stewart, says she welcomes a new state health care plan that comes at a lower cost to the individual. Other parts of the plan called for the use of mercury to treat wounds and the introduction of traditional herbal medicines as the go-to drug for any and all kinds of illnesses.